Rose and her family have been coming to Awago Beach "since...like...forever" but this year is a little different than the rest. Rose's mother is depressed, her father is frustrated, and Rose and her summertime best friend Windy aren't connecting quite like they used to. As the summer unfolds, Rose becomes preoccupied with the older teen drama unfolding at the local convenience store surrounding an unplanned pregnancy as a way to escape the tension at home and secrets surrounding her mom's sudden depression. 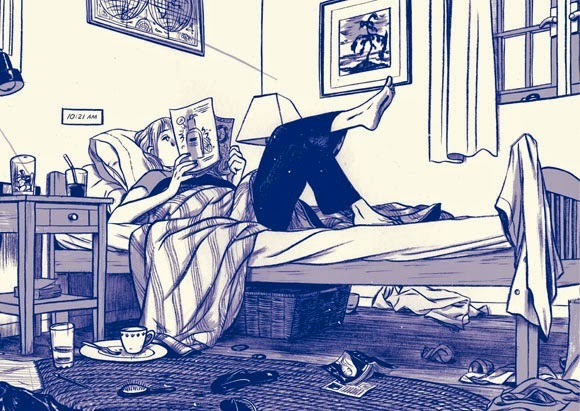 This One Summer is a dreamy, beautifully drawn graphic novel. Rose's family issues plays out alongside the drama of the local teenagers that Rose and Windy spy on and interesting parallels are drawn between the two sets of characters involving pregnancies, love, and how relationships can withstand abruptly shifting dynamics. Rose is a flawed character whose behavior is believably awful at times as she struggles to comprehend why her parents are fighting and as she takes in the very serious consequences of the local teens’ actions. She's observant and strangely apart from the action for most of the story, but her quiet observations are what allow her to ultimately stand up and speak out when it really matters. 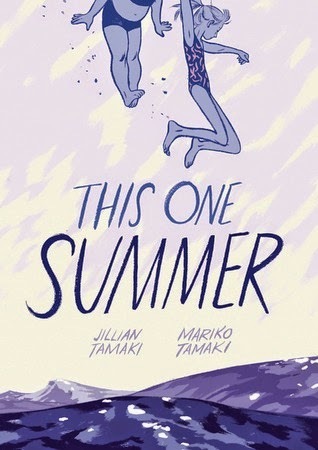 This One Summer is a powerful story about bridging the gap between childhood and adulthood, and fantasy and reality. The art in this book is really lovely. I love the indigo and violet, which does such a great job at conveying this sense of nostalgia for childhood and the past, but yet it's really grounded in the present. I've got it shelved in the YA section, and although I'd be very careful about who I'd hand it to as it does feature some more grown-up content, I'd recommend it to readers who like Raina Telgemeier's work, or are wanting something a little more mature. However, it's not quite as mature as the Tamaki cousins' first graphic novel, Skim. This One Summer is one of those books that slips between middle grade and YA, and easily appeals to readers of all ages. This looks great. I just finished reading Smile and I love Drama, as well as other Tween Graphic Novels. This looks like a great addition to the collection at my library. Thanks. I do like the graphic use of color and the details of a teen room. Well observed!